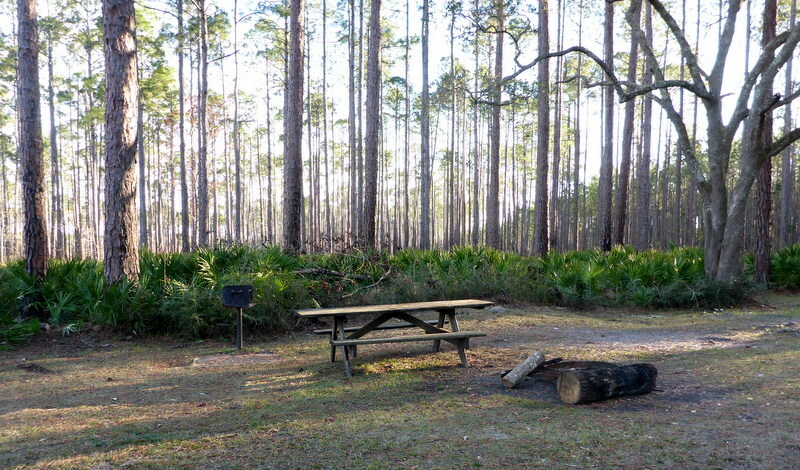 Reserve this site at Reserve America, State’s Hell State Forest, New River Primitive Campsites. When you get to your campsite, check for the closest point for cell connection. 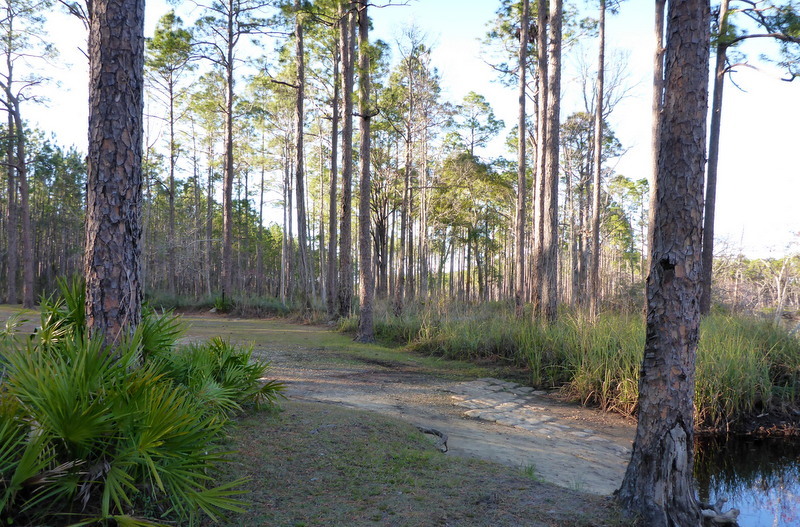 If you call 911, the address of this campsite is 1751 River Road, Tate’s Hell State Forest, GPS 29.91190,-84.73108. Reserve America’s confirmation e-mail or documents will not include this address and first responders will not be able to find you with just a campsite number. Like all other sites on the New River, Parker Place on the west side of the river, can easily accommodate 8 people or 8 small tents and cars. It is a RV/tent site. It has a long and wide entry which can be used for parking or a narrow soccer field for the kids — the palmettos on either side will keep the ball on the field. 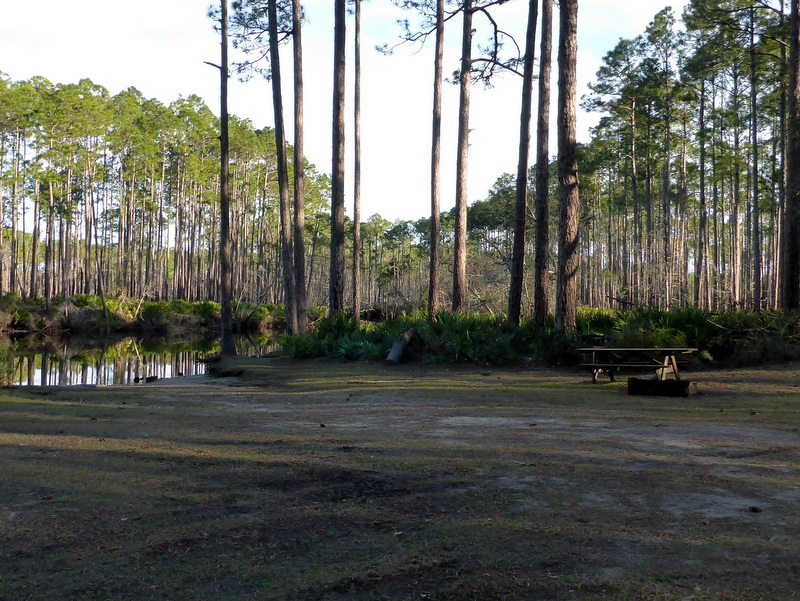 Standard equipment at all Tate’s Hell primitive camp sites are a large picnic table, a fire pit and a standup grill. You should provide your own potable water and dig your own bathroom arrangement in the woods. Having a portable toilet with disposable, biodegradable packets are quite convenient. You are responsible for packing all garbage out of the site. There are bears in Tate’s Hell SF and food and scented items should be kept in the car or hung from a tree far away from the sleeping area. A kayak hatch will not deter varmints! 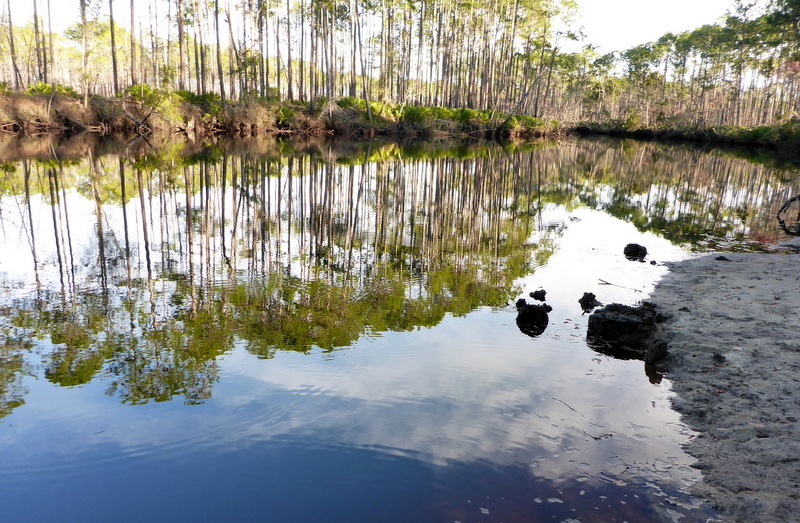 For paddlers, the landing at Parker Place allows for safe put-in and take-out. However, when the tide is out, be careful to step on the visible sand — the landing can drop suddenly. And hold on to your kayak if the current or wind is going downriver. The lower sites on the New allow for a more expansive view because the river doesn’t curve as much. At the end of the day, this is the down river view. And this is the upriver view. The nearest campsites are not within hearing range. How about that for a wilderness camping experience? We recommend a campfire particuarly around dusk to keep the mosquitoes away. Don’t bring campfire from home, unless you’re from Franklin county. 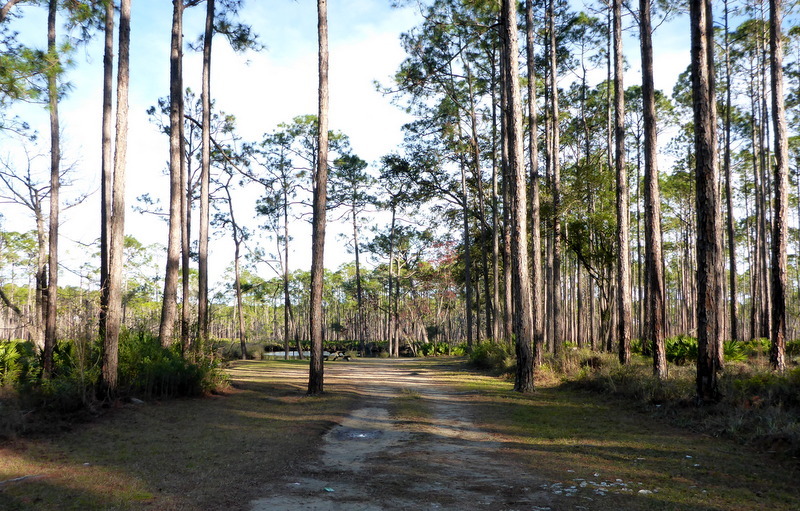 Sometimes forestry leaves firewood at the site; otherwise try the IGA in Carrabelle or inquire at the gas stations. The early riser in the group can also really ingratiate himself/herself to the group by starting a fire on a cold morning. The photos were taken when the tide was outgoing. 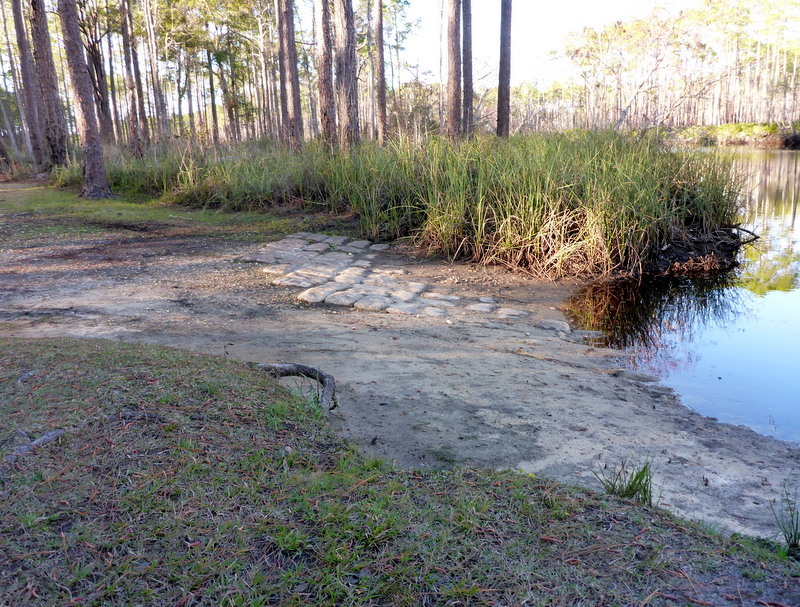 Water levels will vary by tide at this site. 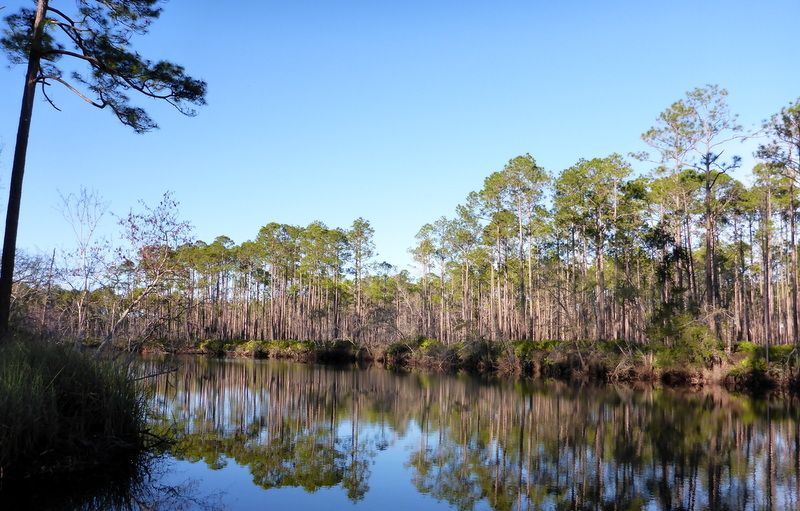 This entry was posted in Camping, New River, Paddling Tate's Hell State Forest, Tate's Hell State Forest camping and tagged Camping Tate's Hell State Forest, Tate's Hell State Forest camping, Tate's Hell State Forest paddling on February 14, 2019 by marylynanded.